Rebrand, Web Design, WordPress, Print Collateral, SEO & PPC. When Brave were approached by long-established retailer T & C Robinsons, we discovered a very special way this particular company takes care of it’s clientele in the prestigious location of Stamford – recognised as ‘The Best Place to Live in Britain’ according to The Sunday Times. Whilst the company had a strong established customer base, they felt they were not appealing to a wider audience. After an initial fact finding session, it was apparent that there was a need to delicately approach a rebrand, something which would need to be handled with the utmost care and attention. Whilst we strategising the overall direction with the rebrand, it quickly became apparent that people thought still thought of T C Robinsons as a saddlery, opinions based on its past origins. To them, it wasn’t clear that they were now a fine leather goods retailer which had changed over the years, yet the visual representation they gave was dated and represented their former self. The other aspect we came to understand, was that they were missing the geographic location connection they had with the prestige of Stamford: after all, they’d relocated there in 1990, one could almost say they are Stamford! It’s with this gained insight which made the strategy simple, that being to make the connection with Stamford and state the obvious in terms of what they offer: a reseller of fine leather goods and accessories. It’s at this point, we recommended a change of name which would link the brand, product offering and location together all in one hit. And that’s when Robinson’s of Stamford was born. We set to work to develop the brand design and create a logo which not only had meaning but also established a look which was professional, prestigious and of high class finish. The decision by our designers to use an interpretation of gates to represent the essence of the gates of Burghley House meant we could get the logo visually closer to Stamford as a location not only by name but by design. After carrying out a full audit on past advertisement design, stationery, retail experience and social recommendations we knew exactly how we would approach this side of the challenge and bring everything together. All of collateral was redesigned and developed inline, with the new rebrand at it’s heart. Whilst it can be straight forward to focus on rebranding alone, many forget how important it is to ‘follow-through’ when it comes to marketing collateral. At Brave we believe passionately that unless you dot the i’s and cross the t’s when it comes to completing your marketing collateral, it can actually do more damage and cancel out a rebrand when strict guidelines are not followed. Luckily, our client understood the value of doing things right and professionally. Finally we were tasked with redeveloping a new look website, one which would be more of a product and service showcase rather than an e-commerce site on this occasion. Initially launched as an e-commerce, but Robinson’s of Stamford are not an e-commerce giant, they are an experience and they have experience in knowing what it is that you want and need. Their new website was designed with that in mind and continues to serve as a window on their shop, literally. We created a clear, stylish, and adaptive website worthy of the new rebrand and one which could grow as their customer base grows. 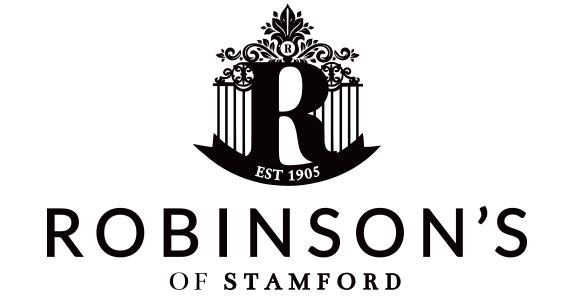 Robinson’s of Stamford is a premium retail boutique brand. We have worked with them to understand their customer behaviours that lead to a sale. For this reason, we helped them fix an issue whereby some customers felt intimidated or simply didn’t understand exactly what they sold, the variety of products on offer or what they stood for from the outside looking in. We used all our expertise and knowledge to deliver a bespoke tailored solution which offered a true ‘Beginning to End’ journey from strategy and rebrand through to marketing collateral both for print and digital. The results speak for themselves as they have seen a strong positive growth increase since the rebrand was unveiled, together with an overall uplift in perception from customer old and new. As with all our clients, we maintain regular communication with them to keep up to speed with their developments and create bespoke campaigns with great results.